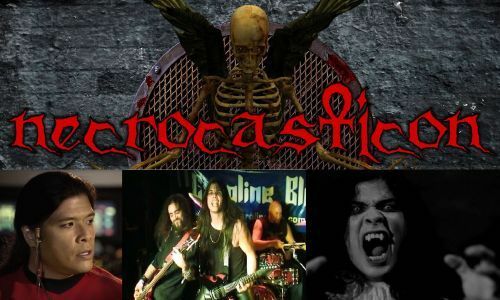 -This week on THE NECROCASTICON-in addition to discussing various topics such as Pokemon Go, TV show “The Preacher” and this week in the history of metal / rock / horror, but also a nice length interview with me (Wayne W. Johnson) where we discuss various film projects I’ve been in (including NIGHT OF SOMETHING STRANGE, TALES OF DRACULA , MOHAWK, STAR TREK NEW VOYAGES: PHASE II + more) but also a good amount about CAROLINE BLUE \m/ The Necrocasticon crew consists of Thomas Clark, Scott Groverston, Walter Ball and Azriel Mordecai. This entry was posted in ACTING, INTERVIEWS, MUSIC and tagged Azriel Mordecai, Dracula Tales of Dracula, horror, INTERVIEWS, metal, mohawk, music, night of something strange, Podcast, Scott Groverston, Star Trek New Voyages:Phase II, The Necrocasticon, The Preacher, Thomas Clark, Volume 2 Chapter 10, Walter Ball, wayne w johnson, WWJ. Bookmark the permalink.